Stump, from The Daily News, working it at the Westminster Kennel Club Show. The Show is Held in Madison Square Garden: MSG is in the 34th Street District. 34th Street, check. Next year I'm so applying for a press pass. Stump is Not Exactly Trim: I wasn't there, but from the photos he looks big boned. Or really furry. Either way, I can relate. We all go through fat days, weight gain fluctuation, etc. But Stump proves not only the skinny guy (ahem, standard poodle) can carry the day. Stump is No Spring Chicken: He's ten years old, which makes him the oldest winner of the Westminster Dog Show. So life doesn't end at 10, it just gets better looking (that's 10 dog years, so let's pretend it's 40 in girl years). And with age comes experience: Stump's trainer said he hardly prepared the Sussex spaniel for the show. It's All in Your Walk, or "Screw the Experts, Wow the Crowd:" The pros were gunning for the giant schnauzer, but the audience loved Stump. 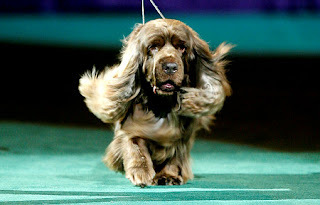 The New York Times said "...the crowd clearly preferred the jaunty spaniel. Stump was greeted with deafening applause every time he plodded around the ring." Plodded! I love that. Learn from Stump, because obviously how you carry yourself can work magic. The Comeback Kid: Stump was stricken with a serious illness in'05, but healed eventually with the help of the experts at Texas A&M. It's been 5 years since he last competed. What a story. I'd kiss him all day. Ok, not really about fashion, but think of Stump when you're feeling like a troll while surrounded by well-dressed beauties. Plod onward with style! And for more Stump, go here for the Westminster Best in Show video. It's a long one, so forward right to 9 minutes and listen to the crowd roar and watch Stump do his thing. All photos from The New York Times except where noted. Yeah, I'm familiar with this feeling: "you're feeling like a troll while surrounded by well-dressed beauties." Hi there-how cute, Stump is just gorgeous! My mom told me about Stump, but I forgot to look him up. WHAT a cutie! I love pets! they are really cute! wendyb - i guess it's a universal girl thing, even for those who are always gorgeous and well -dressed! sharon - isn't he? i can't stop watching the video when he wins. sal - how adorable is he! that walk! kira - me too, and now i really want a stump. P.S. I am impressed you knew about Prometheus!! cc- i lived in dc for years, we'd go down there at all hours and sit on him! mad - I know, i'm watching his video whenever i'm depressed. We just love Stump - he is way too cool! What a great story too, coming out of the Pooch retirement life for this!